Obviously, this one was done at SPX. Garret Izumi writes: “That was a great show, a lot of fun. 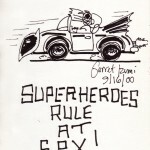 Batman always comes through in a pinch.” See more of Garret’s art, check out his blog, and/or buy something from him.